South African athletics star Wayde van Niekerk presented the Springboks with their match day jerseys on the eve of their Castle Lager Rugby Championship Test against the Wallabies in Bloemfontein. Van Niekerk, the 400m world record holder and Olympic champion, delivered a short and inspirational message to the team on Friday morning. “We as sportspeople sometimes don’t realise the impact we have on ordinary people,” the soft spoken athletics star said afterwards. “South Africans are sports loving people and they look to the Springboks for inspiration. I am a huge Springbok fan myself and to find myself amongst these guys in the middle of the Springbok team room was just an unbelievable and humbling experience. “My short message to them was to go out there and play the game to the best of their ability – they have done their homework and they know what to do,” said Van Niekerk. His coach, Tannie Ans Botha has the honour of being the SA flag bearer tomorrow. Eben Etzebeth will again lead the Springboks on Saturday and said the Boks were absolutely delighted to spend some time with Van Niekerk. “Wayde is an inspiration for us and he is such a humble person. So to receive our match jerseys from him was a huge honour and privilege,” said Etzebeth. 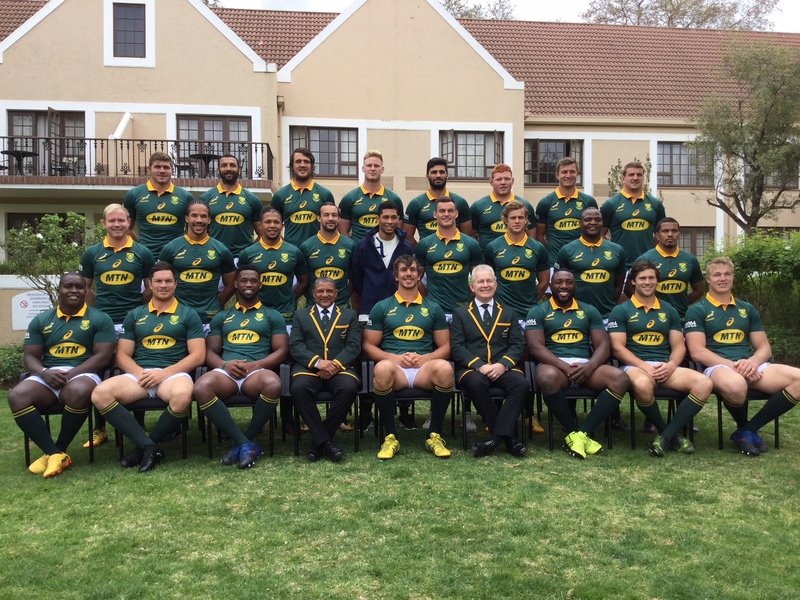 Van Niekerk, who lives in Bloemfontein where he completed his high school career, was also included in the traditional Springbok team photograph after the customary jersey presentation ceremony. The match at the Toyota Stadium, which kicks off at 17h05, is the Springboks’ penultimate fixture of the 2017 Castle Lager Rugby Championship.